The plot thickens. Here, beyond question, is the very same Carmen Fanzone (see Carmen Fanzone, Part 1) that my brother disputed the existence of, now dressed in a Mets uniform and going by the somewhat more innocuous but still vaguely fake-sounding alias of Craig Swan. However, unlike with Carmen Fanzone, I remember Craig Swan. I saw him pitch at Shea and can clearly recall knowing that one year he even led the National League in earned run average, the only Met from the post-Seaver years who ever got anywhere near a leader-board (which should have been the tipoff that something was fishy). 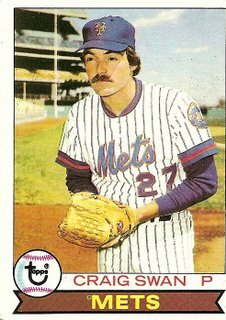 It’s a little unsettling to look at one of the cards from my childhood and have no memory of the player in the photo, but it’s downright jarring to realize that a player I do remember was merely an ephemeral incarnation of an anonymous drifter who skirted the shadows of a series of last-place ballclubs. As far as I know, his ruse was never uncovered. Probably whenever the authorities started to zero in on him, he simply moved on to the next half-empty stadium, leaving behind nothing but a fake mustache.